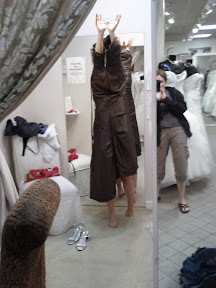 a failure of natural selection: What can your bridesmaids do for you? What can your bridesmaids do for you? Last week Bridesmaid Black Mamba stopped by for a few days of low-key bacchanalia. We managed to squeeze her dress fitting in between staying home and watching television and staying home and doing a puzzle. Unfortunately, this is when we discovered that Black Mamba had been secretly replaced with a piece of cooked ziti! I have it on good authority that she will soon escape from her air-tight holding cell to wreck havoc on an unsuspecting pasta. This message will self-destruct in five (5) seconds. That's _fabulous_. Watch out, pasta, I'm going to attack! There's a higher res photo, but it is controlled by my phone. You and my phone can fight for who gets the picture. The intartubes are moving! Run (to the new url)!